Thyroid hormones play an important role in the physical development, neuronal growth and influence various metabolic processes of the newborn. Their deficiency or a defect in thyroid hormone receptor activity may present as congenital hypothyroidism. This may lead to irreversible mental and physical growth retardation. Interestingly majority of the neonates with congenital hypothyroidism appear to be normal. These facts led us to review this entity in infancy. Therefore, initiation of early treatment becomes essential. Levothyroxine is the drug of choice and its dosage should be adjusted with biochemical hormone assays. The untoward effects of congenital hypothyroidism are largely reversible, if treated before the age of 6 weeks, a very easily affordable help in curtailing the morbidity among these newborns. Genetic counseling and routine examination of siblings is very essential. Pre-conception counseling (PCC), an integral part of obstetric care, is essential for appropriate diagnosis and management of various endocrine and non-endocrine diseases. The concept of PCC has not been adequately highlighted in thyroidology so far. This is surprising, as thyroid disorders are a common medical comorbidity in pregnancy and can potentially harm both maternal and fetal health. This article lays down a framework which can be followed by both obstetricians and endocrinologists while counseling patients planning pregnancy. Aim: Hypothyroidism and metabolic syndrome are well-associated risk factors for atherogenic cardiovascular disease. Insulin resistance, being a common pathogenic mechanism in both, can cause a considerable overlap between hypothyroid and metabolic syndrome population. This cross-sectional study was intended to assess the thyroid function in patients with metabolic syndrome and to investigate the association between hypothyroidism and metabolic syndrome. Materials and Methods: One hundred patients with metabolic syndrome as per National Cholesterol Education Program-Adult Treatment Panel (NCEP ATP) III criteria and 50 controls (0 out of 5 criteria) attending the internal medicine outpatient clinic were included in the study. Patients were subjected to anthropometry, evaluation of vital parameters, and lipid and thyroid profile, along with other routine laboratory parameters. Students' "t" test, Chi-square test, linear regression, and multiple logistic regression models were used for statistical analysis. P value <0.05 was considered significant. Results: Body mass index, waist circumference, mean systolic pressure, diastolic pressure, fasting blood sugar, total cholesterol, low density lipoprotein (LDL) cholesterol, triglycerides, and thyroid stimulating hormone (TSH) were significantly higher, and free triiodothyronine (FT3), free thyroxine (FT4), and high density lipoprotein (HDL) cholesterol were significantly lower in the study group compared to the control group. In the metabolic syndrome group, 22 had subclinical hypothyroidism (22%), 4 were overtly hypothyroid (4%), and 74 were euthyroid (74%). Subclinical hypothyroidism was significantly associated with metabolic syndrome group (P = 0.032). There was significant linear association between TSH levels and total cholesterol, triglycerides, LDL cholesterol, and HDL cholesterol across the metabolic syndrome group in the linear regression model. Multiple logistic regression analysis recognized the association between body mass index with subclinical hypothyroidism (P = 0.006) in the metabolic syndrome group. Conclusion: It is concluded from this study that there is significant association between subclinical hypothyroidism and metabolic syndrome, and it highlights the importance of thyroid function tests in patients with metabolic syndrome. Introduction: Thyroid disorders are the second most common endocrine disorders during pregnancy after diabetes mellitus. Materials and Methods: This is a prospective study involving 2000 pregnant women attending antenatal clinic. Women were screened by serum TSH (thyroid stimulating hormone) estimation by chemiluminescent method after informed consent. Estimation of free T3 (FT3) and free T4 (FT4) were advised if the screening test was abnormal. All pregnant women were followed throughout the pregnancy, labor and postpartum period to note any adverse feto-maternal outcome. Results were analyzed by Chi square test. Results: 82.5% of women belong to age group 21-30 years. 45% women were primigravida and 55% were multigravida. Serum TSH level was normal in 94.2% women. 3.5% women had sub clinical hypothyroidism, 0.9% women had overt hypothyroidism and 0.6% had overt hyperthyroidism. Of all women diagnosed of having hypothyroidism 92% had absence of any high risk factor and 85.7% of women diagnosed of having hyperthyroidism had no high risk factor for thyroid disorders. Conclusion: Even though universal screening for thyroid dysfunction is not yet a recommendation, it should be considered. Background: Fine needle aspiration cytology (FNAC) is the commonly used test for diagnosis of thyroid nodules. FNAC is a cost-effective procedure that provides specific diagnosis rapidly with minimal complications. Based on the cytology findings, patients can be subjected to surgery only in cases of malignancy, thereby decreasing the rate of surgery and its consequent complications. The purpose of our study was to find the diagnostic accuracy of FNAC in thyroid lesions and to compare it with histopathology. Materials and Methods: A retrospective hospital-based study was conducted at Department of Pathology in a tertiary care institute and associated hospital of Bhopal. Data were collected from the records of FNAC and histopathology of thyroid lesions, done in last 4 years duration. Analysis was done by entering data in SPSS software, and Chi-square test was applied to find statistical significance. Results: FNAC was done on 234 patients in 4 years duration. The most common thyroid lesions were benign [221 (94.4%)], followed by malignant only [6 (2.6%)], indeterminate [3 (1.3%)], and inadequate [4 (1.7%)]. Out of 221 (94.4%) benign thyroid lesions, 33% were simple colloid goiter, 27.6% goiter with cystic changes, 16.28% nodular colloid goiter, 10.41% lymphocytic thyroiditis, 4.53% thyroglossal cyst, 4.07% colloid goiter with hemorrhage, 0.9% were follicular adenoma, and others formed 3.17%. Out of six (2.6%) malignant thyroid lesions, three were papillary carcinoma and the other three were follicular neoplasm. Conclusions: The cytological criterion for the diagnosis of thyroid lesions as benign and malignant by FNAC is a highly reliable method for the diagnosis. 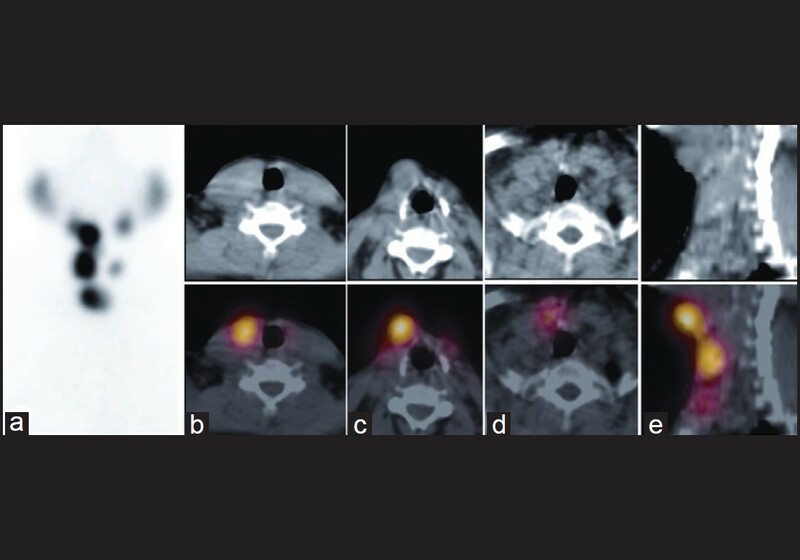 FNAC showed sensitivity, specificity, and diagnostic accuracy of 100% in the diagnosis of malignant lesions like papillary carcinoma as well as thyroglossal cyst and abscess. Background: Advances and improvements in the diagnosis of hypothyroidism have ensured the detection of a larger number of patients. The question that arises is that should we treat patients according to their Thyroid Stimulating Hormone level, which represents their "biochemical health" or according to their symptoms, which represent the health of the whole body? Aim: The current study aimed at exploring the concerns of patients diagnosed with hypothyroidism. Materials and Methods: The research was planned as a single center cross-sectional study at an endocrine center in a district headquarter (Karnal) in Haryana, India. One hundred consecutive hypothyroid patients attending the endocrine clinic were administered a pre-tested, structured questionnaire designed to capture personal, anthropometric, biochemical, and clinical data. Pearson's correlation coefficient was calculated to find out the correlations between continuous variables. Independent Student's t-test was used for in-between group comparisons. Results: The average duration of hypothyroidism in 100 subjects was 5.12 ± 6.87 years. All patients were on L-Thyroxine supplementation. The commonest dose used was 100 mcg/day (n = 35), followed by 125 mcg/day (n = 20). The most important patient rated concern was fatigue (3.39 ± 1.053), followed by neuropathic pain (3.00 ± 1.363) and permanence of medication (2.77 ± 1.377). Other important concerns from the patient perspective were lack of weight loss, lack of well-being and feeling of being sick. Conclusions: The results will help sensitize physicians and endocrinologists towards eliciting a patient sensitive history, while focusing on clinical and social aspects of relevance of the patient's age and clinical picture. Ectopic thyroid tissue (ETT) refers to all cases in which the thyroid gland is present at a location other than its usual site. Hyperthyroidism in ETT is very rare with only a few cases reported in literature. We report a 48-year-old female, a case of relapse of hyperthyroidism 15 years after thyroidectomy. 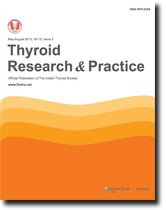 Technetium scanning with hybrid single-photon emission computed tomography (SPECT)/CT showed increased trapping function in residual orthotopic thyroid lobes. Increased trapping function was also noted in two other ectopic sites. The patient was treated with radioiodine. The thyroid gland is the most common endocrine organ which gets operated throughout the globe. It is a highly vascular endocrine gland that is composed of two lateral lobes connected by a narrow median isthmus having an "H" shaped appearance. 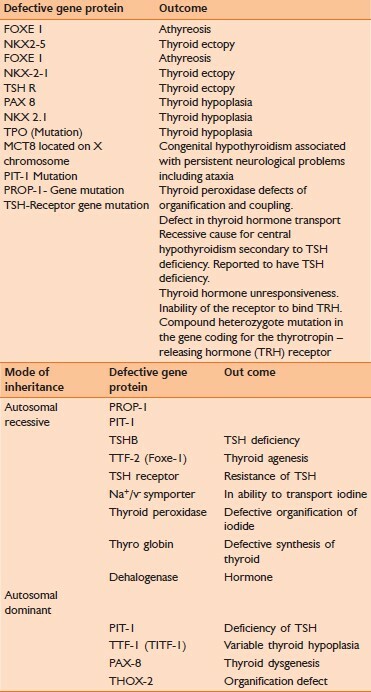 A wide range of morphological variations and developmental anomalies of the thyroid gland have been reported in the literature which can have numerous clinical and surgical implications. 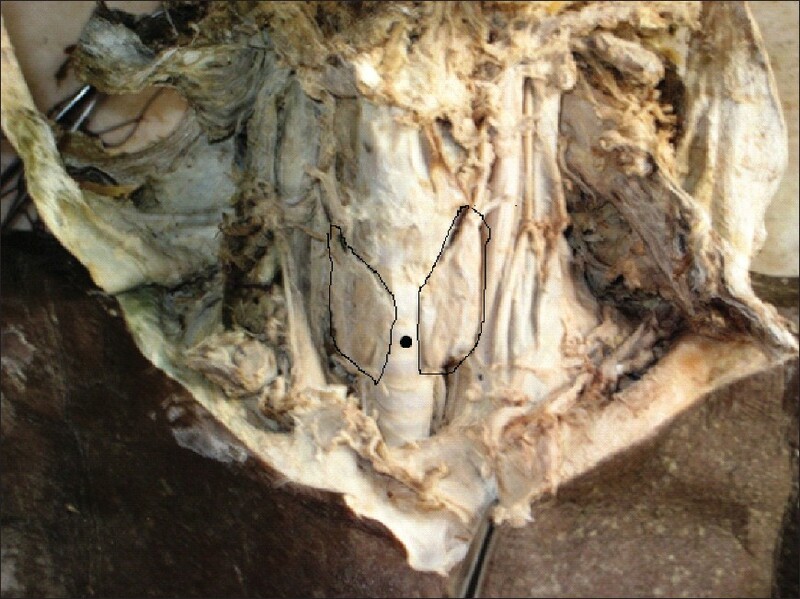 In the present case, absence of the isthmus was observed during dissection on a female cadaver. The respective lateral lobes were positioned independently on either side of the trachea. The present case report aims at discussing the incidence of agenesis of isthmus and its developmental and clinical significance. A 43-year-old woman, with fibroid uterus and menorrhagia with no symptoms attributable to the respiratory system was posted for hysterectomy. 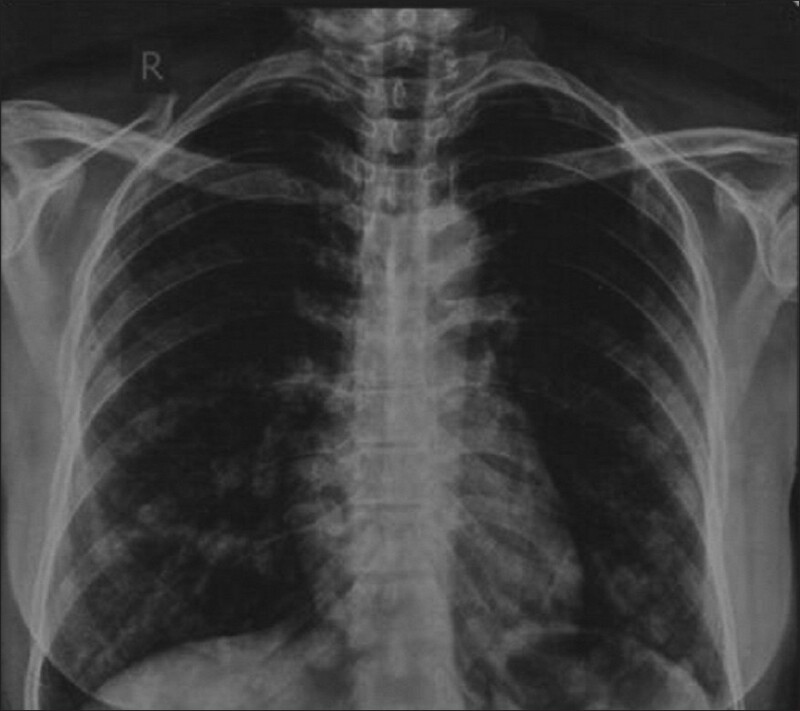 Preoperative chest X-ray showed multiple rounded opacities in both lung fields. Thyroidectomy for papillary carcinoma thyroid was performed 20 years back. 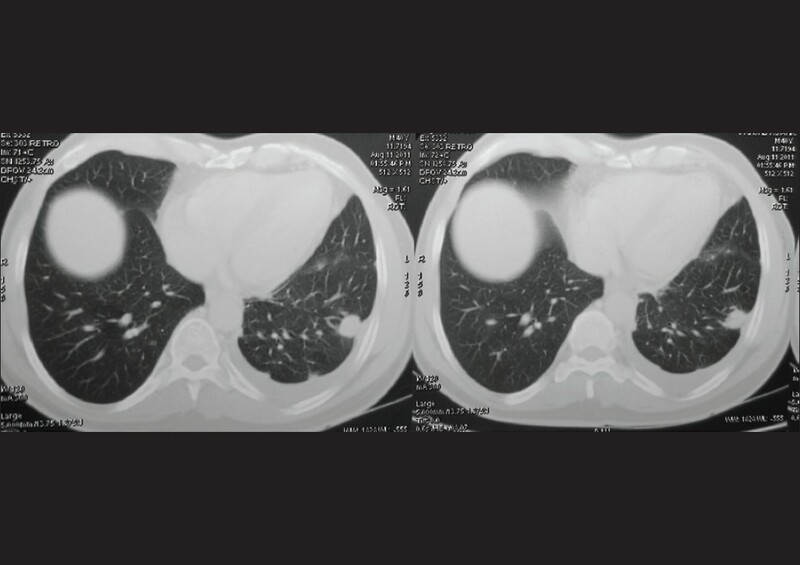 Further investigations revealed recurrence of thyroid cancer with bilateral lung metastasis.